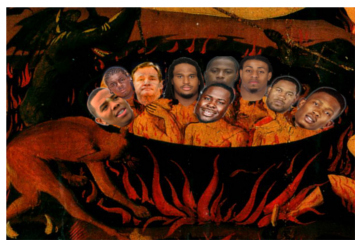 Abuse and the Afterlife | "Granny Beads and Grocery Store Feet"
NFL players charged with domestic violence along with the man who enables them roasting in Dante’s Inferno. I am not an expert on the afterlife of any religion, including my own Christianity, but if the afterlife is a means of obtaining ultimate justice from a holy and just God, I am certain of one thing — an especially hot, miserable, and demon infested corner in the lowest bowels of Hell is reserved for people who abuse children, the elderly, the helpless, and animals. Then, right below THAT little slice of paradise will be a sewer just for men who abuse their spouses, girlfriends, and other women in their lives. It’s one of the first lessons I learned even before I went to kindergarten as a child: BOYS DON’T HIT GIRLS! It is a rule deeply etched into my psyche, into my very bones. Every boy I knew growing up, from all sides of the tracks and every type of home environment had the same lesson drilled into them: BOYS DON’T HIT GIRLS! I realize some of them probably didn’t see the lesson modeled very well for them at home and some of them were probably too busy trying to dodge punches themselves to give much thought to philosophy of gender, but all of us learned it nonetheless. I am extremely biased because I saw men modeling the lesson for me all the time. Daddy and I have had our disagreements over the years and he and Mama divorced when I was small, but I can swear to this and Mama confirmed it long before she ever died — for all of Daddy’s faults, he never raised his hand to Mama nor lay a single finger on her in anger. Even in the most bitter moments of their marriage disintegrating, Daddy didn’t even raise his voice to argue with Mama. He and my stepmother, Teresa have been married nearly 40 years now and they have had some barn burners of fights, but Daddy has never so much as taken an aggressive step towards her. 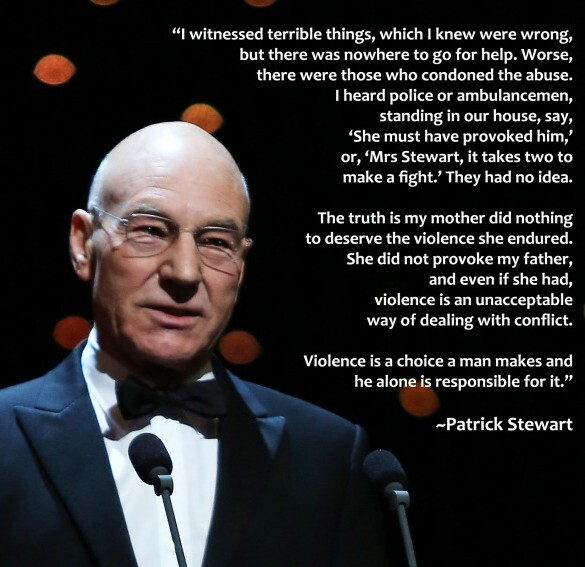 Neither of my Papas were violent men. I don’t know if I ever heard Papa Wham speak above a normal conversational tone more than twice all the days I knew him. The face of domestic violence. What if Lindsay was your neighbor, co-worker, or even a stranger in a store? Apparently, though, many of the “men” now playing professional sports think it is somewhat fashionable to knock the important women in their lives unconscious, as Ray Rice recently did in a horrific moment captured on a hotel security camera. Strangely, once the video surfaced to wide exposure, we find out a veritable slew of other players have CDV charges pending or even convictions. Looks like a lot of NFL “men” aren’t “leaving it all on the field” but instead are “bringing the pain” home to their loved ones . . . although how you can claim to love someone you just knocked unconscious with a left hook worthy of George Foreman is beyond me. What seriously turns my stomach, however, is how so many people are more concerned with whether or not these players are going to be allowed to continue on their teams instead of how they are punished. I don’t think the argument should be on if they get to stay in the NFL; it should be whether or not they get to stay on the streets or even stay in our midst. But that’s all I have to say about the NFL’s domestic violence woes because I’m not naive enough to think this is an NFL problem — domestic violence is a societal problem. All across the nation in every region and every demographic, men are terrorizing their wives and children. Some stories are nothing short of nightmarish like Lindsay Arp who was left disfigured and partially paralyzed after her live in boyfriend poured boiling oil over her body while she slept. Here in South Carolina a man has recently been arrested for murdering his FIVE children, dismembering their bodies, and scattering the pieces in garbage bags all across four states. That’s just two cases out of THOUSANDS! What I want to know is why isn’t anyone doing anything about this? These people had neighbors, co-workers, SOMEONE had to have noticed. The were not like the Lykovs living alone a million miles from nowhere. Clerks at grocery stores had to notice black eyes. Why didn’t anyone do anything until it was nearly too late for many CDV victims? This is what disturbs me the most. Have we not progressed any farther as a civilization than the New Yorkers of Kitty Genovese’s time, than the Europeans who watched their neighbors loaded into boxcars in the late 1930s and early 1940s? Once upon a time in this country, granted it was long, long ago and seemingly in a galaxy far far away, a man would not idly stand by while another man beat a woman or a child. Oh, sure, every generation has raised its share of people who refuse to “get involved,” but our current generation seems to me especially craven. What are we afraid of, being sued? Do we possess anything more dear to us than another human’s life? I’m afraid that answer is “yes.” Are we terrified of being shot or stabbed ourselves? Is our own life so much more valuable to us than anothers? Again, I’m sure it is “yes” for all but a meager handful of people. Love y’all, keep those feet clean. Thanks for being brave enough to write this.